Own DC Comics - The Flash Justice League Mug from Deff, DVD, Blu-Ray & 4K Video Specialists - Free UK Delivery..
Own The Flash - Be Yourself Mug from Deff, DVD, Blu-Ray & 4K Video Specialists - Free UK Delivery..
Own The Flash - Lightning Strikes Mug from Deff, DVD, Blu-Ray & 4K Video Specialists - Free UK Delivery..
Own The Flash - Red Blur Mug from Deff, DVD, Blu-Ray & 4K Video Specialists - Free UK Delivery..
Own The Flash - Running Mug from Deff, DVD, Blu-Ray & 4K Video Specialists - Free UK Delivery..
Own The Flash - Solo Mug from Deff, DVD, Blu-Ray & 4K Video Specialists - Free UK Delivery..
HO-O-O-O-OSH! The origins and exploits of the crimefighting DC Comics superhero come your way at lightning speed in this 22-episode live-action series. John Wesley Shipp portrays Barry Allen, a police crime technologist endowed with sudden talents after a fluke lab accident. He pledges to use his new powers for good, powers that include ultra-speed reflexes and the ability to vibrate his molecules so rapidly he can pass through solid wa..
Own The Flash - The Future Framed Print 30 x 40 from Deff, DVD, Blu-Ray & 4K Video Specialists - Free UK Delivery..
Central City forensic investigator Barry Allen is smart, charming and - as a result of a scientific experiment gone awry - now the fastest man alive! He's The Flash, zigzagging through the action-packed new series from the creative team behind Arrow and based on the supersonic DC Comics character. With his life shadowed by his mother's murder and his father wrongly convicted of the crime, Barry finds that his newfound power of super-spe.. 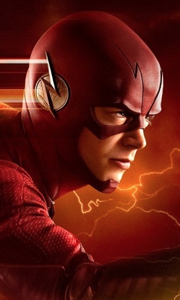 Struck by the supercharged fallout of a particle accelerator explosion, forensic scientist Barry Allen becomes the fastest man alive: The Flash! With his newfound time-warping speed and help from the S.T.A.R. Labs team - Caitlin Snow, Cisco Ramon and Harrison Wells - and his adoptive family, Detective Joe West and Joe's daughter Iris West, the Scarlet Speedster runs circles around other metahumans intent on wreaking havoc in Central Cit.. In Season Three, Barry Allen, aka The Flash, is living a happy and dangerous dream life in the alternate Flashpoint universe. But his nemesis, Reverse Flash, warns of serious repercussions if Barry remains there. Now Barry must deal with his identity crisis while he and the S.T.A.R. Labs team fight lethal threats from the God of Speed, Savitar. Special Features Special Features May Not Be In High Definition. Audio And Subtitles May Var..
Last season, Barry Allen aka The Flash (Grant Gustin) used his extraordinary abilities to travel back in time and save his mother’s life, and inadvertently created an alternate timeline known as Flashpoint. The phenomenon not only gave birth to the villainous God of Speed known as Savitar, but changed the lives of Caitlin Snow (Danielle Panabaker) and Wally West (Keiynan Lonsdale) forever. With the help of his adoptive father, Detective..
Own The Flash Seasons 1 to 4 Blu-Ray from Deff, DVD, Blu-Ray & 4K Video Specialists - Free UK Delivery..
Own DC Comics - The Flash Mug from Deff, DVD, Blu-Ray & 4K Video Specialists - Free UK Delivery..
Own DC Originals - The Flash Logo Pattern Mug from Deff, DVD, Blu-Ray & 4K Video Specialists - Free UK Delivery..
Own DC Originals - The Flash Mono Logo Mug from Deff, DVD, Blu-Ray & 4K Video Specialists - Free UK Delivery..
Own DC Originals - The Flash Mug from Deff, DVD, Blu-Ray & 4K Video Specialists - Free UK Delivery..
Own Justice League Movie - Flash Action Mug from Deff, DVD, Blu-Ray & 4K Video Specialists - Free UK Delivery..
Own Justice League Movie - Flash Logo Drip Mug from Deff, DVD, Blu-Ray & 4K Video Specialists - Free UK Delivery..
Own The Flash - Central City All Stars Mug from Deff, DVD, Blu-Ray & 4K Video Specialists - Free UK Delivery.. The galaxy's ultimate crime-fighting strike squad, Justice League, continues its on-going battle against enemies on the Earth and beyond! In "Paradise Lost," sorcerer Felix Faust turns Wonder Woman's Amazon sistersto statues of stone! Then, Superman is captured by the warlord Mongul and plunged into a gladiator-style fight to the finish on an alien planet. Now, only Green Lantern and Hawkgirl can save their caped friend from the battle ..
Own The Flash - Lightning Mug from Deff, DVD, Blu-Ray & 4K Video Specialists - Free UK Delivery..
Own The Flash - New Destinies Mug from Deff, DVD, Blu-Ray & 4K Video Specialists - Free UK Delivery..
Own The Flash - STAR Labs Mug from Deff, DVD, Blu-Ray & 4K Video Specialists - Free UK Delivery.. Struck by the supercharged fallout of a particle accelerator explosion, forensic scientist Barry Allen becomes the fastest man alive: The Flash! With his newfound time-warping speed and help from the S.T.A.R. Labs team - Caitlin Snow, Cisco Ramon and Harrison Wells - and his adoptive family, Detective Joe West and Joe's daughter, Iris West, the Scarlet Speedster runs circles around metahumans intent on wreaking havoc in Central City, wh.. In Season Three, Barry Allen, aka The Flash, is living a happy and dangerous dream life in the alternate Flashpoint universe. But his nemesis, Reverse Flash, warns of serious repercussions if Barry remains there. Now Barry must deal with his identity crisis while he and the S.T.A.R. Labs team fight lethal threats from the God of Speed, Savitar. Special Features Epic DC Super Hero Crossover Event With Arrow, DC’s Legends Of Tomorrow And..
Own The Flash Seasons 1 to 2 Blu-Ray from Deff, DVD, Blu-Ray & 4K Video Specialists - Free UK Delivery..